Drowning is always a risk for children regardless of their ability to swim. When I began researching drowning risks I was shocked to find that even the leading child safety experts were not promoting swimming lessons as the first line of defense against drowning. I have also observed public service announcements from Children’s hospitals that DO NOT mention swimming lessons at all or simply mention that a child’s risk for drowning is not lessened by being able to swim. I have even made an effort to ask people if the ability of a child to swim reduces their risk of drowning. 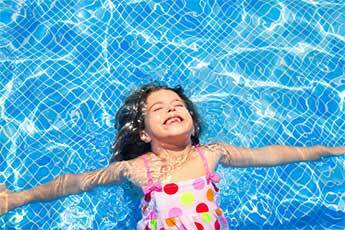 To my surprise, at least 85% of people believe that a child that knows how to swim has a reduced risk of drowning. Unfortunately, this belief is false. Parents mistakenly believe that if a child has learned a swimming skill they are safer in the water. Tragically, parents get “comfortable” when a child has the ability to swim and diligence around the water fades. Ask yourself if you feel “comfortable” with your child’s swimming skills. As a fun summer activity, swimming with friends and family is great, however, there are many situations when a child may end up in water and find themselves frightened, panicking, and looking for help. Usually a child in this type of situation has one thing on his or her mind — find mom. It is important that a child learn to proactively solve the problem without anyone around to help because if no one is there they only have precious seconds before its too late. Teaching a child to be self reliant in the water is critical because water can be overwhelming and unpredictable; just keeping an eye on your child or not is not a real choice. The dangers of water are real and uncontrollable. Replacing a child’s natural instinct of “looking for mom to help” with the instinct to “save myself” in the water is the single most reliable step in preventing a drowning tragedy. Remember that drowning is always a risk for children. This entry was posted in Drowning Risks, Information and tagged facts, MOM, risk by squids. Bookmark the permalink.